President of the Pradesh Congress Committee Sri Niranjan Patnaik has expressed support to the cause Bhasha Andolan stands for. On February 6, Presidium of Bhasha Andolan had made an appeal to all the political parties to assure in their respective manifestoes that they will support its call for the removal of all hurdles from the inviolable implementation of the Orissa Official Language Act including the notorious Section 4-A inserted in the Act by Chief Minister Naveen Patnaik with the sole purpose of denying the Oriyas their right to get official services in their mother tongue. 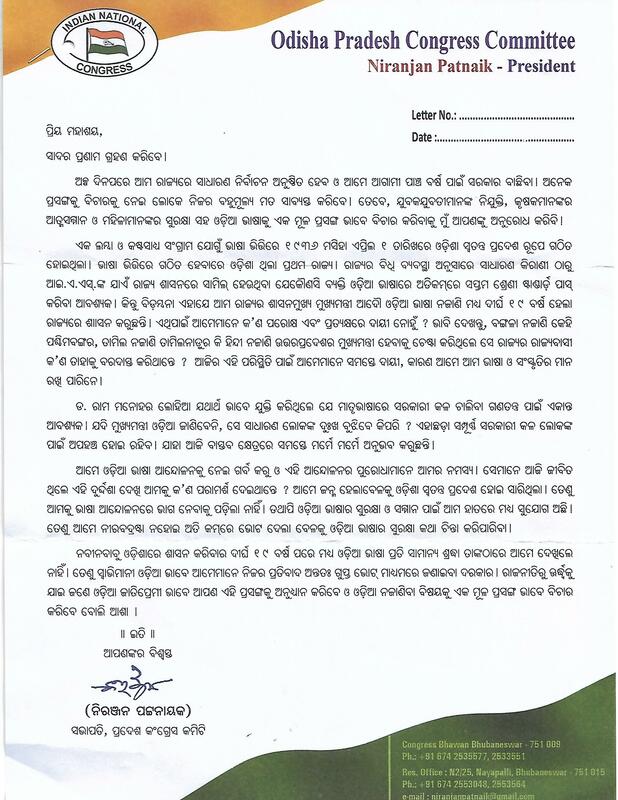 The Congress Party is the first political party to have expressed in writing through its Pradesh Committee President its agony over non-implementation of the Act, though the letter does not say whether or not the cause of Oriya Language, as is being espoused by Bhasha Andolan, shall find its place in their manifesto. All political parties must clear their stand on making Odia language compulsory in Administration,judiciary,employment,business,media etc.with punishment measures.